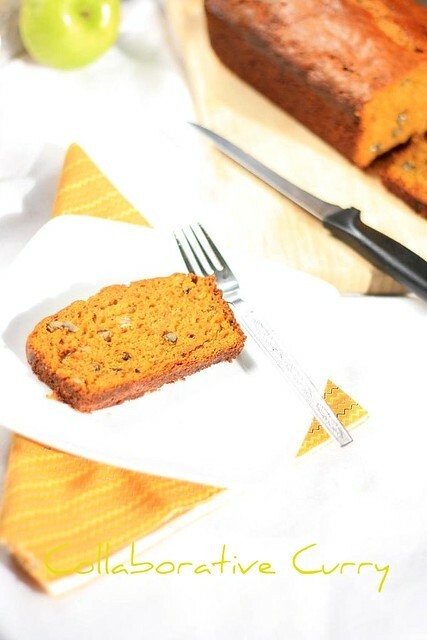 Pumpkin bread is a fall season favorite, and I have been meaning to share it with you for a while. Soon after making the Pumpkin Pie for Thanks-giving, I baked this bread. It is lightly sweetened, making it perfect for breakfast and spicy enough to make it interesting as an evening snack. Christmas weekend kept me busy hopping from one get together to another, and I had a full- house of wonderful friends even the day before. It has been a great year as far as celebrations go and I have no reason to complain. It’s all good. Well! maybe I should not have said that quite so fast. With both my children home when I am not partying, I am dancing to a different tune-theirs! When I am not cooking, I am trying to act as mediator in the millionth fight they get into. Then comes cleaning, and my laundry basket always seem ominous. One of these days, I fear it will take on a life of its own and crawl up to me demanding attention. While I struggle with the nuisances of daily life, I hope you stay warm and have a fantastic day! This is so easy peasy and tatsy ! 1.Sift together the flour, baking powder, baking soda and the spices in a large mixing bowl. 2.Preheat the oven at 350 degree F and grease a 9 by 5 inch loaf pan. 3.Mix the pumpkin puree, oil, sugar, eggs and sour cream using a hand blender. 4.Fold in the flour mixture alternating with the nuts and pour into the prepared loaf pan. 5.Bake for ~45-50 minutes or until a skewer inserted comes out clean. 6.Cool on a wire rack. You're right! The colour is beautiful! Happy Holidays:)! perfectly baked dear...reading your post reminds me I need to do my washing today!! 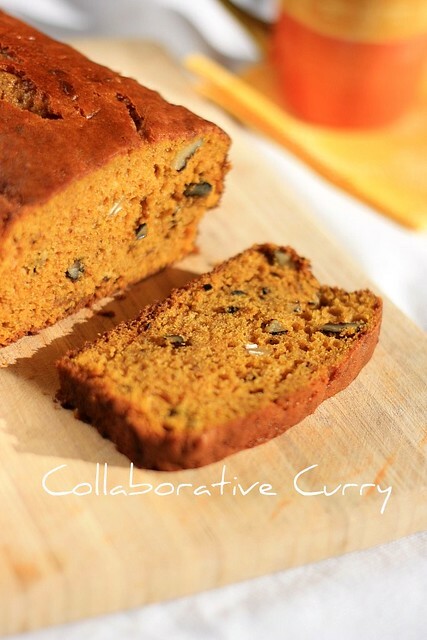 Pumpkin bread looks wonderful and flavourful ! I wish a few slices for the breakfast tomorrow! Yummy! Mouth watering and delicious pumpkin bread. 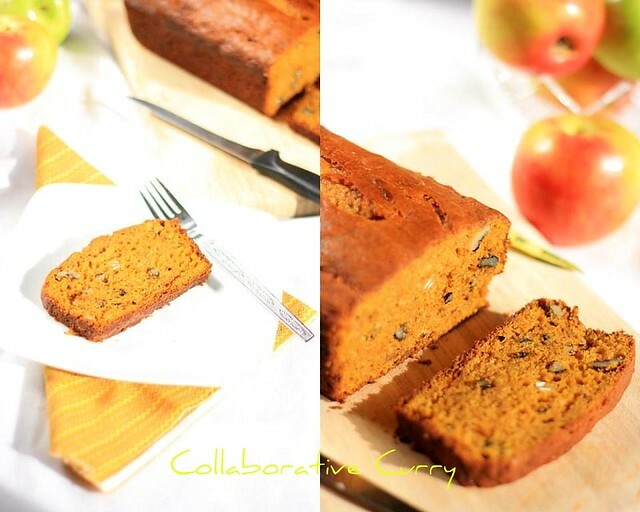 Mouthwatering pictures of the pumpkin bread..Love it! Pumpkin bread looks wonderful..beautiful color,love it. Pumpkin bread looks delicious. I too love the color. Wow looks super delicious and beautiful color and slices. Thank you for stopping by and visiting Gulmohar. My apologies for not stopping by sooner. I have been very busy with many things especially with the holidays. This bread looks wonderful and the recipe sounds delicious! Your pumpkin bread looks divine! I wanted to add nuts to mine but my daughter said no, and it was her idea. Hope your having and lovely holiday with your family! Pumpkin bread looks super awesome and the pics are great. Happy New Year in advance to you and your family. Beautiful and perfect bread! Love the idea of adding olive oil in the recipe.. I love pumpkin in baked goodies..this one looks perfect! The bread looks extremely moist and supple. Like the color and pumpkin in it. Very beautiful shots.. Amazing recipe.. thanks for sharing !! In fact, it look beautiful and good. Wishing you a Happy New Year ! what a lovely cake.. ya! nice clicks too .. jus love its colour! Amazing...Looks perfect & delicious. Love it. the pumpkin bread looks so colouful and tasty. Pumpkin good for health...nice bread! Love the colour and texture of the bread. Just looking at your pictures I am in the mood for making some pumpkin bread! Love it! beautiful pics and bread looks delicious..
Hello ladies :) just stopping by to wish you a very happy new year! lovely pumpkin bread....wish u a very happy newyear.. Beautifully baked,soft and delicious bread!! Wish u & sunitha a very happy & prosperous 2011!! looks so perfect n yummy!! Lovely bread color, Wishing Both of U and ur Dear ones a very Happy New Year!